It wasn't a question of whether Microsoft would release Office for iOS, but when. The company just released a free Office Mobile app for the iPhone, and it's available today in the US, with other regions to follow over the coming days. Before you all go rushing off to the download link, though, there's something you need to know: an Office 365 subscription is required in order to use the app. That's a bummer for people who bought a traditional copy of the suite, or who normally use other word processors, but it makes perfect business sense for Microsoft. After all, the company doesn't want to give folks too many reasons to use iOS, and it also needs to protect the precious revenue stream that is Office sales. In any event, if you do have a 365 subscription, you'll be delighted to know that the iOS app does not count toward your limit of five PC / Mac installations. Rather, you get to install the application on up to five iPhones, the same way you can put the full suite on up to five computers. Also, in addition to merely viewing whatever Word, PowerPoint and Excel files you already had stored in SkyDrive, you can also make light edits. Additionally, you can create new documents from your phone, though this only applies to Word and Excel, not PowerPoint (understandably so, we think). Again, the app is available today in the US, and for the iPhone, specifically; for the iPad, Microsoft is steering people toward its Office web apps. As for other platforms, the company won't comment on whether an Android version is in the works. At any rate, all you iPhone owners with 365 subscriptions can get your download on now. And then you can read on past the break, where we've got some screenshots and hands-on impressions at the ready. To run Office, you'll need an iPhone 4, 4S or 5 (or a fifth-gen iPod touch) running iOS 6.1 or higher. Since you already have an Office 365 subscription, you won't need to create any new usernames or passwords; just enter the email address associated with your Office / Microsoft account, followed by the password. Boom. Voilà. You're in. What you'll see next is a home screen with four little tabs at the bottom for opening files, creating new ones and jumping to recently used documents. You can also adjust the settings using the tab farthest to the right. Each of these tabs is pretty self-explanatory, we'd imagine, and as you'll find throughout the entire app, none of these menus goes very deep. Depending on how much of a power user you are, the paucity of options could be frustrating, but if nothing else, the simple layout means you'll never get lost inside the app. By default, the app synced with my SkyDrive account, though you can also add a SharePoint library. Obviously, that's a no-brainer; Microsoft would integrate Office Mobile with its own SkyDrive service. But it's worth noting that other iPhone office suites like QuickOffice and Documents To Go don't support SkyDrive, so if that happens to be your storage service of choice, Office Mobile already has a leg up. As a nice perk, you can view your SkyDrive photos inside the app, even though it was really built around Word, PowerPoint and Excel. Syncing your files also works just like you'd expect: open your SkyDrive folder and then swipe down on the screen to refresh. As for creating a brand-new file, you can open a blank Word document or Excel spreadsheet, with three templates in each category (think: budget, agenda, etc.). Though Word, PowerPoint and Excel each offer different features, they generally work the same way. Across the board, you'll find a trio of shortcuts along the top of the screen, including a save button, followed by another for editing. Hitting that formatting button will pull up a drawer full of options along the bottom of the screen, right where the onscreen keyboard usually appears. This is the place where you do things like bold text, or change the background color (and not much else, as you'll see). Finally, the third shortcut lets you choose a different viewing option, whether it's data sorting in Excel, Outline View in Word or a slide overview in PowerPoint. 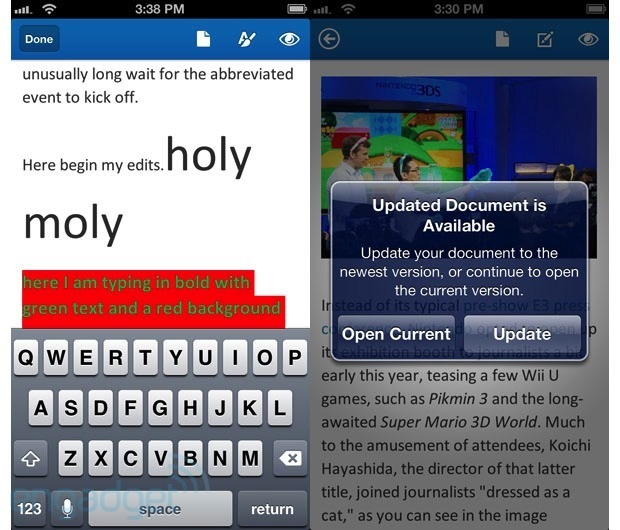 When you're ready to exit the document, tap the back arrow in the upper-left corner. If you haven't saved your most recent changes, you'll be prompted to (though you of course don't have to). That's all well and good, but there is one thing about the app that feels unintuitive. When you've got the formatting options pulled up at the bottom of the screen, you need to press a down arrow to make the formatting menu go away. It's not like when you're using the iPhone keyboard, and you can just tap the background to make it disappear. If you've been using iOS for a while, this one little quirk could take a lot of getting used to. Let's start with what you can do. While the full version of Word has evolved over the years to make it easier to add YouTube videos, the mobile app is all about the text. Using Office for iPhone, you can write stuff, making use of features like bolding, underlining, italics and a strikethrough feature. You can change the color of the text and background, but your only choices in either case are red, yellow or green. You can also adjust the size of the font, but all you have to work with are onscreen plus and minus buttons. And... that's it. No visual cues as to where you are on the spectrum of font sizes. So, you could be at 48- or 72-point font. You won't really know until you dismiss the formatting menu and resume writing. As you'd expect, at least, you can use the iPhone's highlighting tool to retroactively change the text color or font size. This partially makes up for the fact that you can't select font sizes from a list: at least you can see how each change will look like while the text is still highlighted. Additionally, there are some other, less important features missing; things for which we can probably wait for an update. These include: font options, text alignment, bulleted lists and, again, more color choices, all of which you can find in, say, the Google Drive app. It's a similar story with Excel: the app has some good features in its 1.0 state, but we'd like to see Microsoft take things even further. Similar to some other apps, like Google Drive, you can't insert new rows or columns anywhere you want, though you can use the blank cells at the very bottom or on the far right. As on Google Drive, you can't delete random rows or columns either. In this case, though, you can't even add a new spreadsheet tab -- plenty of other apps let you do that. 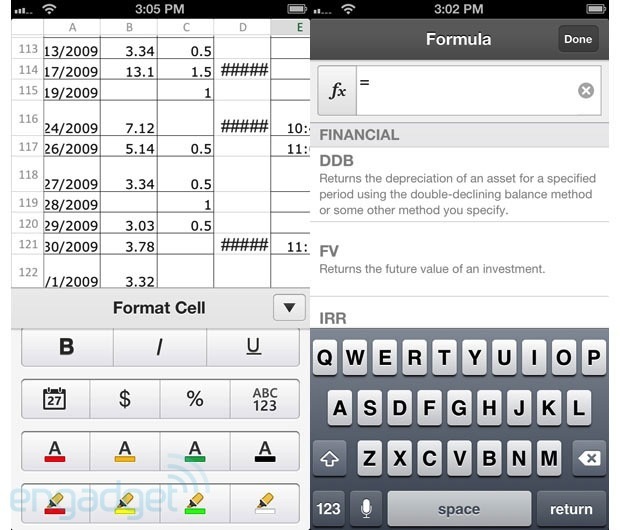 Clearly, then, Microsoft's got the ingredients for a solid Excel app -- charts, simple formatting for individual cells. The visuals and formulas, in particular -- Google's app doesn't do any of that. But these features only mean so much if you can't insert rows of fresh data. The way it stands now, you can either start from scratch, making sure you put everything in the right order the first time out, or you can rearrange the deck furniture on existing spreadsheets, adding columns or rows at the very edge of the document only. It's a fine start, but it's not a completely workable solution either. Of all the apps here, PowerPoint feels the least crippled, if only because editing a presentation on a phone seems like a less likely scenario to begin with. 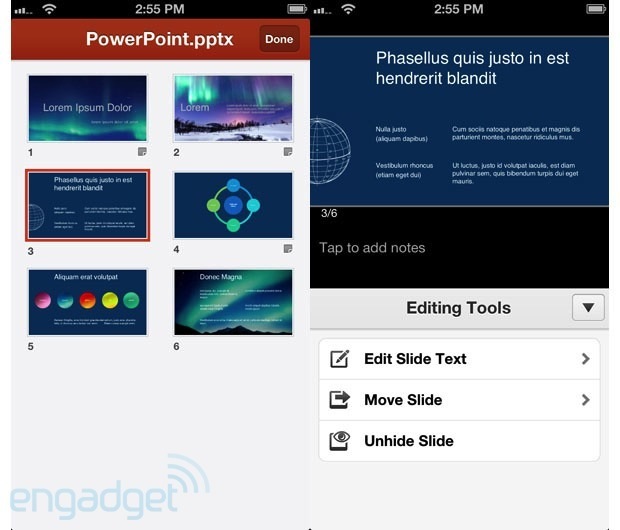 Using the app, you can change slide text, move slides, hide them and add notes. And frankly, that's about as much as we'd imagine doing on the iPhone's 4-inch screen. Create new slides? Add transitions? Those are the sorts of things we'd do at our desk, well before it's time to leave for a meeting, or take off on a business trip. Ideally, by the time we're in transit, we'd only need to make small corrections here and there. And if you did leave your presentation for the last minute? Well, you do travel with a laptop, dont'cha? We can't tell if Microsoft deliberately handicapped Office Mobile for iPhone, or if it's simply saving some features for a later update. (A company rep declined to comment on what we can expect from future versions.) We're willing to believe Microsoft still has some unfinished items on its to-do list, but even so, it's a shame that iPhone users waited this long for an Office app, only to get something with such a minimal feature set. All told, Office Mobile represents a good enough start for Microsoft, and in some ways it's better than Google Drive, particularly where spreadsheets are concerned. Still, it's miles behind other office apps for iOS, including Apple iWork. 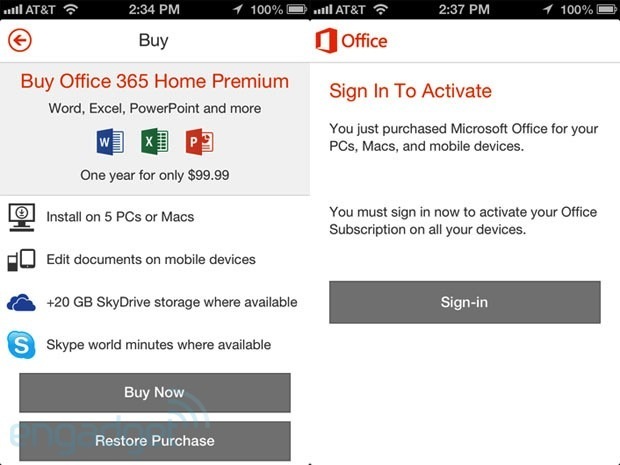 If you're an Office 365 subscriber, you might want to try out Office Mobile anyway, if only because many competing office suites for the iPhone don't support SkyDrive. And besides, it's free, so you've got absolutely nothing to lose. Even then, though, you might want a more full-featured app, depending on your needs, at least until Microsoft updates Office Mobile with some additional features. As for the rest of you without a 365 subscription, you're not missing much -- at least not yet.